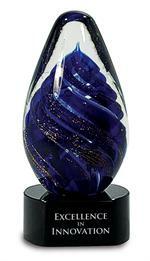 The Blue Tear Drop Art Glass Award is a beautifully crafted glass trophy, that is suitable for any achievement or acknowledgment. It has unique design, and weighted black glass base that will accommodate a large engraving plate, this 6 3/4" tall, elegant beauty is made ready to recognize the best! 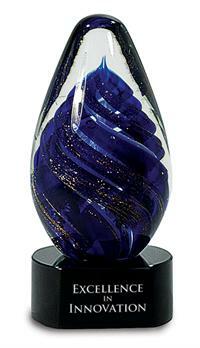 The Blue Tear Drop Art Glass Award comes packaged in a lined gift box. Its a stunning piece of art sure to standout! This unique award is a great way to acknowledge any employee or teammate.